THE 26TH ANNIVERSARY CELEBRATIONS OF HAMSADHWANI CELEBRATED IN ASSOCIATION WITH SRI KRISHNA SWEETS, ON 18TH AUGUST 2016. The well-attended function was presided over by Shri K. Parasaran, the former Attorney General of India. While welcoming the gathering Secretary Mr R. Sundar recalled the pioneering initiative of the founder secretary Shri Ramachandran in establishing the cultural organisation in the southern district of greater Chennai in 1990 and in ensuring that it developed into a vibrant cultural institution on strong foundations. The Distinguished Citizen Award jointly presented every year on its foundation day by Hamsadhwani and Sri Krishna Sweets was conferred on Shri R K Raghavan, former director of CBI by Shri Parasaran. Shri Parasaran congratulated Hamsadhwani on its choice of Shri Raghavgan for this year’s award whom he described as one of the most distinguished and outstanding officers of the Indian police and law enforcement administration. 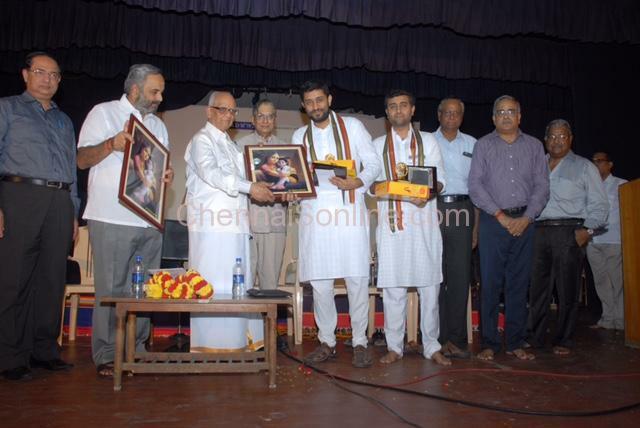 The annual Hamsadhwani Ramachandran Sathabishekam Award for 2016 was presented to Trichur Brothers – Shri Sri Krishna Mohan and Shri Ramkumar Mohan – by Mr Parasaran and Mr Raghavan respectively. The anniversary day and award function was followed by a special concert by Trichur Brothers, who enthralled the audience with their customary enchanting music.